Time-tested and proven dependable, the strength of Steelgrip lacing is enhanced due to the common bar, which yields a continuous lacing strip for the width of the belting. Thus, the tension is distributed across the entire belt width. While made from a special steel that allows the points to pierce the belt carcass, the teeth are designed to enter the belt fabric without cutting the longitudinal strength members of the belting. First, determine the size, quantity, and material below. Then, click on the Product Line tab to select your needed product SKUs. Steelgrip lacing comes in 8 sizes for belts from 1⁄16″ to 3⁄8″ thickness. The lacing is cross-scored so that it can easily be broken by hand to exactly fit any belt width exactly. First, determine the size and metal specifications. Then, click the Product Line tab above to view the complete Steelgrip product line. Standard for sizes 00, 1, and 7. Good for abrasion utilizing a low-carbon steel. Galvanizing provides some resistance to elements. Magnetic and poor chemical resistance. Standard for sizes 15 through 45. Good for abrasion utilizing a low-carbon steel, which has good forming characteristics, allowing easy installation. Magnetic and poor chemical resistance. A nickel chrome stainless steel that offers excellent resistance to fatty acids and wash-down chemicals, also good for mechanical abrasion. Excellent for use where food and sanitation requirements are high. Basically non-magnetic. Each standard box and economy pack includes lacing, gauge pin, corrugated hinge pin, and instructions. 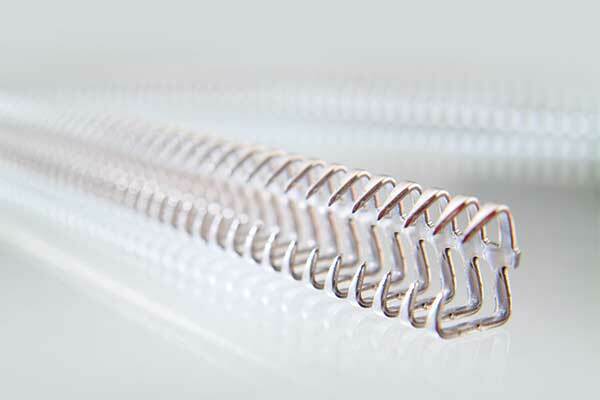 Steelgrip Long Length Conveyor Belt Lacing for flat conveyor belt applications. Steelgrip lacing is available in eight styles and an almost endless variety of lengths to suit the specific application. The advantage of long lengths is to assure uniform pull across wide belts, distributing tension of the belt evenly. Steelgrip long length lacing is available from stock in most popular long lengths up to 60″. Special lengths, including continuous strips for extremely wide belts, are also available. Steelgrip long length lacing is specially mounted, and shipped in cartons designed specifically for the purpose in order to prevent bending or end damage. 4 complete sets of lacing with gauge pin and 4 hinge pins. A convenient way to purchase our quality product for counter display. These cartons come packed with 10 individual 12-inch sets in their own poly-wrapped enclosure. Each contains a gauge pin and hinge pin. Sold in cartons only. Steelgrip shipping weight was calculated based on a 12" lacing length. Shipped in sets of 4.